In addition to Grenada Electricity Services and Jamaica 28MW Content Solar, below are examples of WRB's Caribbean experience. In 1982, WRB and TCU launched one of the first successful electric utility privatizations in the Caribbean. The utility was modernized and upgraded to 99%+ reliability. One of the region’s first wind turbines was installed in 1986. When Hurricane Ike devastated the island nation in 2008, WRB rebuilt the electricity infrastructure, demonstrating its long-term commitment to the region and its customers. Coupled with electricity services, WRB provided water desalination services for Grand Turk, providing millions of gallons of clean water for residents. WRB collaboratively expanded operations in the Caribbean when it became a majority shareholder of Dominica Electricity Services in May 2004. WRB worked to reduce fuel costs and improve reliability, efficiency, and customer service to help bolster economic development in the nation. 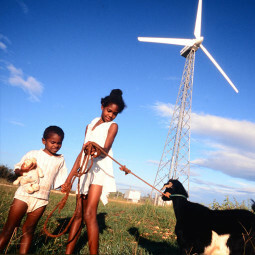 Pioneering renewable energy with one of Jamaica’s first wind turbines at Munro College, 1996. WRB installed one of the first wind turbines in Jamaica at Munro College in 1996. Today, WRB continues to contribute to Jamaica’s growing renewable energy portfolio with its recent Jamaica Content Solar 28MW project—the largest solar project in the Caribbean. Further expanding opportunities in the West Indies, WRB owned and operated West Indies Video Ltd., and Turks & Caicos Television, Ltd. for more than two decades to advance international communications.